Paul studied law at Strathclyde University and obtained a degree with first class honours. He qualified as a solicitor in 2008 and called to the Bar in 2013. 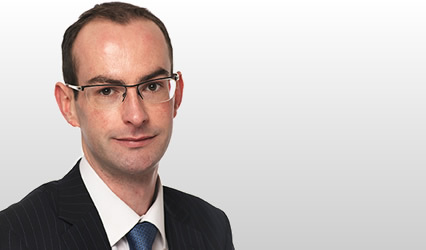 As a solicitor, Paul practiced predominantly in commercial litigation with particular emphasis on commercial contracts, insolvency and intellectual property. He has also advised on a wide range of matters including employment law, company law and public procurement issues. Paul fully understands the economic realities of litigation and can be relied upon to seek resolution by negotiation where appropriate and to provide sound and reliable tactical advice when litigation is necessary. He has appeared on a frequent basis in the Sheriff Court conducting proofs, debates and appeals. He also has experience conducting hearings in the Employment Tribunal. As a solicitor, Paul also had extensive experience in the Court of Session and was part of the legal team in the following reported cases: Sidey Limited v Clackmannanshire Council 2010 SLT 607. Paul acted for the second defender and the decision of the Inner House clarified an important issue regarding the application of European procurement rules in Scotland. Rowan Timber Supplies (Scotland) Limited v Scottish Water Business Stream Limited  CSIH 26. The decision provides guidance on the correct application of section 6(4) of the Prescription and Limitation (Scotland) Act 1973 as to whether a creditor was induced to refrain from making a claim for repayment as a result of the debtor’s conduct so as to interrupt prescription of the creditor’s claim.